In the wake of losing the Lucky Strike account, SCDP was experiencing a bit of a PR problem, with new clients unwilling to do business with a company that appeared to be going under. So Don pulled a stunt. In a strategy meeting with SCDP, consultant Geoffrey Atherton (Dr. Faye's boss) likened the company to "a certain kind of girl" and suggested that the tobacco industry is its ideal boyfriend, recommending pursuing Phillip Morris. After a montage of stress, worry, and number crunching, Don runs into Midge, the free-spirited beatnik girl ("sideline ho") he used to sleep in the first season. She cons him into coming back to her apartment to meet her new creep of a husband. 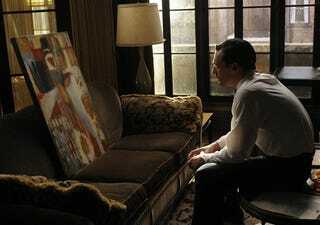 Once Don is left alone with him, the guy first tries to sell him one of Midge's paintings—an "after image"; what she sees when she closes her eyes. When that doesn't seem to work, he tries to sell Midge, trying to pimp her out for some cash. We learn that the couple are broke and addicted to heroin, and that Midge didn't run into Don accidentally. She sought him out, as a mark. Don takes pity on her and gives her some cash (since she doesn't have a checking account) and ends up taking one of her paintings home anyway. But it turns out that he actually becomes inspired by the idea of an "after image" and the question it poses: What's more real? Reality, or what we see? So he sits down and pens an open letter (admonishing his "boyfriend" the tobacco industry, as he smokes a cigarette) that he publishes as a full-page ad in the New York Times, doing for his company what he does best—changing public perception. Some people at SCDP are mad, while others, like Megan, "get it." He was letting the world know "he didn't dump me, I dumped him." His mission statement about the tobacco industry served really to just blow a bunch of smoke up everyone's asses. So far, the only good thing to come out of his stunt was a meeting with the American Cancer Society for a possible PSA. It doesn't seem like a win, but nobody in 1965 would be able to predict how prevalent anti-smoking campaigns would become in the future. Meanwhile, Sally Draper is "cured." Or at least, only needs to go to therapy once week. This upsets Betty, because even though she's unwilling to admit it, she needs her own sessions Dr. Edna more than Sally does. It doesn't seem to register with her that she's finding a child psychiatrist most helpful with her "adult" problems. Sally is actually finding comfort in her deep conversations—dream analysis, religion, the daunting idea of eternity—with Glen. Her observations of product packaging coupled with her fear of "forever" really drives home the point that she's her father's daughter. Ironically, Betty once had a similar relationship with Glen, which she eventually realized was inappropriate. Just like what the Heinz guy said about beans, life is cyclical. When Betty discovers that Sally and Glen share a friendship, she decides that now is the time for the family to move, which will undoubtedly cause Sally—who had just recently gained a sense of stability—to unravel again. Back at the office, budget cuts caused many SCDP employees to lose their jobs. Dr. Faye, however, was forced to resign, as a conflict of interest, since her boss, Atherton, didn't want to be associated with a company that didn't want to be associated with the big money that tobacco could bring. She stops to say goodbye to Peggy, who is genuinely sad to lose Faye, her heroine of sorts. She tells Faye, "You do your job so well. And they respect you. And you don't have to play any games." Faye responds, "Is that what it looks like?" It would seem that Dr. Faye's entire existence at the office was an "after image." And it was real for Peggy, proof of what she thought wasn't possible. It was sad for her, in that moment, to learn that she had fallen for a constructed reality. But on the flip side, perhaps this means that Don's New York Times stunt could actually work out for the company.